Analysis: The Chargers head coach seemed emphatic about the veteran's potential return, saying it was "absolutely" possible, but then later downplayed the possible interest, suggesting the organization was in "wait-and-see" mode. In any matter, if Gates were to return he likely would play a minimal role considering Hunter Henry (torn ACL) is expected to be fully healthy for the start of training camp, and the ever reliable Virgil Green is still in the fold. Analysis: This shouldn't come as much of a surprise given Gates seemed to indicate following the Chargers' divisional-round loss to the Patriots that he was interested in returning to the team in 2019. However, with Hunter Henry expected to be fully healthy following a preseason torn ACL and Virgil Green still in the mix, it's unclear how many snaps would even be available if the soon-to-be 39-year-old returned for another season. Analysis: After coming out of retirement this past offseason to help the Chargers replace an injured Hunter Henry (knee), many assumed Sunday's playoff game would be Gates' final time lacing up the cleats. However, it seems the 38-year-old has a desire to play another season. The question entering the offseason will now be whether Los Angeles feels he can still be a worthwhile contributor. The team is set to have both Henry and fellow tight end Virgil Green under contract in 2019. Analysis: Through 15 games this season, Gates has logged 28 catches (on 43 targets) for 333 yards and a pair of TDs. While those numbers are well below what the 38-year-old posted in his top seasons, Gates has been targeted five times in each of his last two games, a degree of involvement that gives him modest fantasy utility in deeper PPR formats. Gates caught four of his five targets for 54 yards in the win Thursday over the Chiefs. Analysis: Losing Keenan Allen (hip) meant that Antonio Gates immediately asserted himself as Philip Rivers' favorite target between the 20s, gravitating past his usual checkdown role to actually snag a couple of longer receptions. It's encouraging to note that Gates could be a relevant fantasy asset should the situation arise, but with just two weeks left in the regular season it seems asinine to suggest the veteran tight end could be counted on to consistently put forth this type of production. Gates caught his only target for 18 yards in the 45-10 win over Cardinals on Sunday. 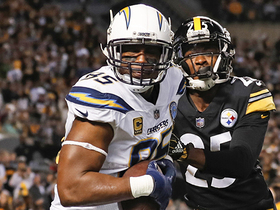 Analysis: Antonio Gates and third-string tight end Sean Culkin caught their lone receptions, as the tight ends as a whole were hardly featured in a game that quickly became a blowout. The ageless veteran has struggled to get involved for much of the season, but he'll look to have a greater impact in what figures to be an offensive shootout against the Steelers next week. 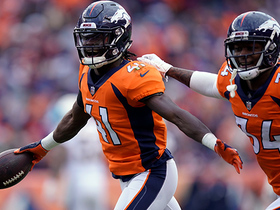 Gates (knee) caught five of seven targets for 80 yards and a touchdown during Sunday's 23-22 loss to the Broncos. Analysis: Gates finished second on the team in targets as he set season highs in catches and yardage. He topped his day off with a 6-yard touchdown catch in the third quarter for his second score of the season. Gates had topped 27 receiving yards just once this season, so this outstanding performance came out of nowhere for the veteran, who dealt with a knee injury of late. He'll look to follow it up next Sunday against the Cardinals. Gates (knee) is listed as active for Sunday's game against the Broncos. Analysis: Gates is a low-volume option in the Los Angeles offense these days, and with just one touchdown in nine games to date, the 38-year-old tight end is largely off the fantasy radar. Gates (knee), who is listed as questionable for Sunday's game against the Broncos, is expected to play, Adam Schefter of ESPN reports. Analysis: Gates missed a couple of practices this week before getting on the field Friday in limited fashion. Though that will likely be enough for the 38-year-old to avoid an absence, he's no longer a major part of the Los Angeles offense at this stage of his career, averaging just 2.5 targets per game. Expect Gates to once again split work at tight end with blocking specialist Virgil Green. Gates (knee) is listed as questionable for Sunday's game against the Broncos. Analysis: Gates was sidelined for the Chargers' first two practices of the week while managing the knee issue, but was back on the field Friday in a limited capacity. If Gates ends up being ruled out Sunday, fellow tight end Virgil Green would see a modest uptick in his Week 11 fantasy outlook. Gates (knee) was a non-participant in Thursday's practice. Analysis: There wasn't any indication that Gates was hurting coming out of Sunday's 20-6 win over the Raiders, but his back-to-back absences from practice so far in Week 11 suggest otherwise. The Chargers will likely need to see Gates put in some on-field work Friday before signing off on his availability for this weekend's showdown with Denver. Gates didn't practice Wednesday due to a knee issue. Analysis: Gates still has a couple of days to return to practice in advance of Sunday's game against the Broncos. Given that he's been a low-volume option in the Los Angeles offense of late and has just one touchdown in nine games, Gates largely remains off the fantasy radar. Gates caught one of his two targets for 18 yards in the 20-6 win over the Raiders on Sunday. Analysis: The veteran tight end has rarely been needed the past two weeks as the Chargers have maintained a comfortable margin throughout both games. That might not be the case next week as the Chargers face off against their bitter division rival, the Broncos. Gates secured two of his three targets for 11 yards in Sunday's nail-biting 20-19 win over the Titans. Analysis: At this point, any notion of the veteran tight end returning to his former fantasy glory has to be cast aside, as Gates has seen over 16 percent of the target share just twice this season. He remains a fantastic option to move the chains when called upon, but the lack of targets and snaps (13 to Virgil Green's 32 on Sunday) would suggest Gates is not a rosterable fantasy asset at this stage of his career. Gates caught just one of his two targets during the 38-14 win over the Browns on Sunday. Analysis: Neither Gates nor Virgil Green had to do much in this one, as the Chargers easily jumped out to a massive first-half lead. The veteran tight end has caught more than two passes just once through the first six weeks of the season and remains a very low-end fantasy option, at best. Gates caught both of his targets for 19 yards in the 26-10 win Sunday over the Raiders. 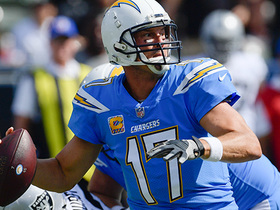 Analysis: Gates was used minimally during the game as the Chargers held a comfortable lead throughout. The veteran tight end has played over 30 snaps just once through five weeks, and remains a longshot in terms of a fantasy option. Gates caught two of his five targets for 27 yards and a touchdown in Sunday's 29-27 win over the 49ers. 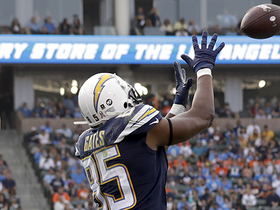 Gates caught three of five targets for 45 yards Sunday in the Chargers' 35-23 loss to the Rams. Gates (illness) is listed as active for Sunday's game against the Rams. Analysis: Gates, who didn't re-sign with the Chargers until Sept. 2, could potentially recapture his previous red-zone chemistry with QB Philip Rivers down the road, but until that happens, he'll remain a speculative fantasy play. Gates (illness), who is listed as questionable for Sunday's game against the Rams, is expected to play, Adam Schefter of ESPN reports. Analysis: The ailment caused Gates to miss two practices this week, with the tight end only returning to the field in a limited capacity. Gates has apparently made enough progress in his recovery over the last couple of days for the Chargers to feel optimistic about his availability, but the 38-year-old may only be slated for a limited role behind Virgil Green. After logging 33 offensive snaps in the season-opening loss to the Chiefs, Gates only played 11 snaps in the Week 2 triumph over the Bills. Gates (illness) is listed as questionable for Sunday's game against the Rams. Gates (illness) did not practice Thursday. Analysis: We'll revisit Gates' status Friday, but as long as he's able to practice in any capacity he should be able to suit up Sunday against the Rams. 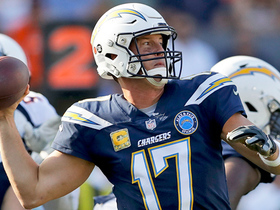 With just two targets through the Chargers' first two games, however, Gates is a speculative fantasy play until he recaptures his previous red-zone chemistry with quarterback Philip Rivers. Gates sat out Wednesday's practice with an illness. Analysis: Gates should recover from the ailment in time to suit up Sunday against the Rams, but with just two targets through the Chargers' first two games, the veteran tight end is off the fantasy radar until he recaptures the previous chemistry he displayed with quarterback Philip Rivers in the red zone. Gates did not catch his only target in Sunday's 31-20 win over the Bills. Analysis: Gates only played in 11 offensive snaps as the Chargers raced out to a substantial first half lead. The veteran tight end is expected to be used sparingly, but with a difficult matchup against the Rams next week, Gates could find himself on the field more as another receiving option. Gates caught two of his three targets for 16 yards in Sunday's 38-28 loss to the Chiefs. Gates is not among the Chargers' Week 1 inactives Sunday against the Chiefs. Analysis: The fact that Gates only recently re-joined the Chargers could lead to him being eased into the mix, but even in a potentially limited role in Week 1, the 38-year-old tight end gives QB Philip Rivers a familiar red-zone weapon to look for. Though Gates has just three days worth of practice to prepare for Sunday's season opener against the Chiefs, he hasn't ruled out playing in the contest, ESPN's Eric D. Williams reports. "I've always been optimistic about playing in a game, whether I was injured or not here -- it didn't matter," Gates said. "So, I think I'm well aware of the preparation that needs to be put in throughout the week to go play a game at the highest level possible. With that being said...it just depends on how I feel leading up to Sunday." Analysis: Gates' late arrival to the mix could lead to him being eased in, but once he's deemed up to speed conditioning-wise, he figures to fill a key role in the Chargers offense, notably as a red-zone weapon for QB Philip Rivers. The team had been prepared to move on from the 38-year-old tight end, but a serious knee injury suffered by Hunter Henry in May paved the way for Gates' return. Gates' role in Sunday's season opener against the Chiefs has yet to be determined, Jack Wang of the Los Angeles Daily News reports. "I don't think you can just throw a guy in the game -- I don't even know if he's going to play," coach Anthony Lynn said of the recently re-signed tight end. "I've got to see what type of shape he is in and go from there. Definitely, he would be on a pitch count." 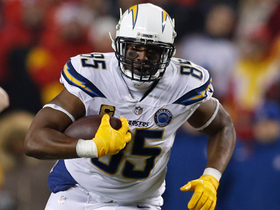 Analysis: It's therefore not a big surprise that Virgil Green is listed ahead of Gates on the team's initial depth chart, but once the 38-year-old is in game shape, he figures to serve as a steady red-zone threat for QB Philip Rivers, with Hunter Henry having suffered a torn ACL in May. Gates is signing with the Chargers, Adam Schefter of ESPN reports. Analysis: The Chargers initially planned on moving on from the 38-year-old tight end, but they acknowledged having some level of interest after Hunter Henry suffered a torn ACL in May. Gates figures to handle a part-time role on passing downs, while Virgil Green likely will serve as the starter and take on a heavier snap count. Given the late timing of the transaction, Gates isn't a lock to be ready for Week 1 against the Chiefs. The Chargers are still considering whether to re-sign Gates, Eric D. Williams of ESPN.com reports. Gates is still an option for the Chargers, ESPN.com's Eric D. Williams reports. Analysis: The Chargers initially planned to move on from the 38-year-old tight end, but they reconsidered the plan after Hunter Henry suffered a torn ACL in May. While the team still hasn't signed Gates, general manager Tom Telesco recently acknowledged that he remains open to the idea. 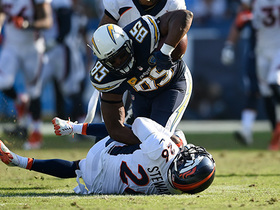 Virgil Green, best known for his blocking, is the only tight end on the Chargers roster (besides Henry) with a catch in the NFL. The Chargers likely will consider re-signing Gates in the wake of Hunter Henry's torn ACL, Eric D. Williams of ESPN.com reports. Gates wants to continue playing football, even though the Chargers told him this offseason they don't plan to re-sign him, Adam Schefter of ESPN reports. Gates remains unsigned, making it unclear if he plans to continue playing football, Dan Woike of The Los Angeles Times reports. Gates indicated he plans on returning for the 2018 season, but didn't rule out joining another team during the offseason, Mike DiGiovanna of the Los Angeles Times reports. Gates indicated Sunday following the Chargers' 30-10 victory over the Raiders that he intends to play in the NFL in 2018, Jack Wang of the Los Angeles Daily News reports. Analysis: Though Gates took on even more of a backseat to second-year tight end Hunter Henry in the Chargers' passing attack in 2017, he still proved effective in a secondary role, hauling in 30 of 52 targets for 316 yards and three scores. Gates, who is set to become a free agent this offseason, will turn 38 years old in June and will most likely have to settle for a one-year deal if he elects to keep his career going. Gates (illness) does not carry an injury designation for Sunday's game against the Raiders. Analysis: With Hunter Henry (kidney) on IR, Gates figures to be busy in the Chargers' passing game in Week 17 against a beatable Oakland defense. The 37-year-old tight end proved that he can still get it done in Week 16, recording a season-high six catches on eight targets for 81 yards and a TD in the Chargers' 14-7 win over the Jets. Gates (illness) missed practice Thursday. Analysis: We suspect that Gates will bounce back in time for Sunday's game against the Raiders, and he'll be needed this weekend, with fellow TE Hunter Henry (kidney) on IR. Gates turned in his best outing of the season in Week 16, logging six catches on eight targets for 81 yards and a TD in the Chargers' 14-7 win over the Jets. Gates led the way in Sunday's 14-7 win over the Jets with six catches for 81 yards and a touchdown on eight targets. Analysis: Gates stepped up in a big way in the absence of fellow tight end Hunter Henry (kidney). The 37-year-old tight end got position on 22-year-old rookie safety Jamal Adams for a three-yard touchdown in the second quarter while blowing past his previous season-highs in catches (three) and yards (32). Gates may not have much gas left in the tank speed-wise, but the savvy veteran can still create space with his big body. Chargers head coach Anthony Lynn suggested that Gates will be part of a committee at tight end with Hunter Henry (kidney) out for the season, Dan Woike of the Los Angeles Times reports. 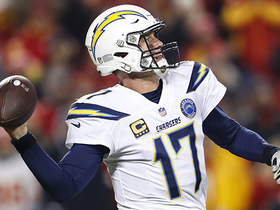 Analysis: While Henry's absence frees up quite a few snaps and targets, the Chargers seem to view Gates as a passing-down specialist at this advanced stage of his career. Jeff Cumberland and Sean McGrath should take on some of the vacated early-down snaps, while the Chargers' wideouts could help with the targets. The injury does help Gates' prospects for Week 16 against the Jets, but he's still unlikely to match Henry's recent level of production. Gates caught one of three targets for a 10-yard touchdown in Saturday's 30-13 loss to the Chiefs. 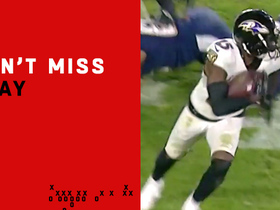 Analysis: Gates tied for fifth on the team in targets, but his 10-yard touchdown grab in the third quarter briefly gave his team its only lead of the evening. The emergence of Hunter Henry has coincided with Gates catching one or no passes in seven of the last nine games, making a return to the end zone highly unlikely in next week's matchup with the Jets, though we'll at least note Henry did leave Saturday's game with an injury of unknown severity. 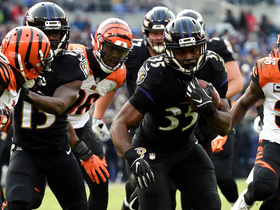 Gates caught three of his four targets for 32 yards in Sunday's 19-10 win over the Browns. Analysis: The Chargers repeatedly took advantage of their opposition's inability to cover the tight end, as Hunter Henry and Gates combined for 10 catches for 113 yards. The future Hall of Famer has firmly taken a back seat to his younger predecessor, but should Henry succumb to any sort of injury, Gates could still have some viability as a fantasy asset. Gates did not record a catch in the 54-24 win over the Bills on Sunday. Analysis: While Gates was targeted twice throughout the game, the veteran tight end was rarely needed thanks largely to a stellar performance from the team's defense. With Hunter Henry receiving a major share of the tight- end snaps, Gates should not be considered a fantasy asset at this stage in his career. Gates caught one of his two targets for three yards in the 20-17 overtime loss to the Jaguars on Sunday. Analysis: Gates has seen his playing time fall completely to the wayside, with No. 3 tight end Sean McGrath seeing nearly as much reps as the ageless veteran Sunday. As a result, Gates should only be rostered in the deepest of fantasy leagues. NFL Network's Steve Wyche discusses the latest injury updates on Los Angeles Chargers tight end Hunter Henry and running back Austin Ekeler, as well as the future plans for tight end Antonio Gates. Baltimore Ravens cornerback Tavon Young returns a fumble by Los Angeles Chargers tight end Antonio Gates for a touchdown. Los Angeles Chargers tight end Antonio Gates catches a 22-yard pass from quarterback Philip Rivers. NFL Senior Fantasy Analyst Michael Fabiano breaks down the top five players that thrived and disappointed in Week 11. Los Angeles Chargers tight end Antonio Gates catches a 25-yard pass from quarterback Philip Rivers. Los Angeles Chargers tight end Antonio Gates catches a 6-yard touchdown from quarterback Philip Rivers. 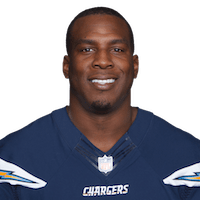 Los Angeles Chargers tight end Antonio Gates makes an impressive shoestring catch for 14 yards. Los Angeles Chargers quarterback Philip Rivers slings a pass to his tight end Antonio Gates for 16 yards after escaping the pocket.